Personal Care Aide helping a patient. Careers for personal care aides are projected to skyrocket in number as home health care becomes increasingly popular with the elderly, disabled and ill. Personal care aides (PCA) and home health aides are hired to help adults retain independence in their own homes by checking in and providing routine care. While home health aides often work in an agency under a physician or nurse to provide medial in-home care, personal care aides provide more standard housekeeping or personal care routine services. Home health aides might administer medications, change bandages, monitor health statuses, check vitals, help with prescribed exercises and routines, or provide any number of tasks similar to personal care aides. Personal care aides may help with shopping, bathing, feeding, cooking, cleaning, dressing, or any other common daily living activity. 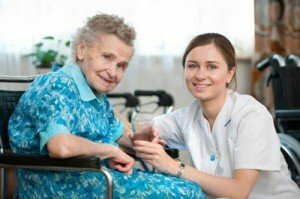 Both home health aides and personal care aides may provide short term or long term care. Are you willing to work long hours? Personal care aides may be needed at any time of the day or week for help. They may be required to work long shifts or odd hours. Are you responsible and organized? Caring for the disabled, elderly or ill will require careful attention to detail. Are do you have the empathy and patience required? Patients may be grumpy, disagreeable, confused or otherwise difficult to deal with. Personal care aides have to gently and firmly care for all types of people. Will you be able to provide the type of care needed? Every situation is different, but care in personal hygiene, bathing, washing may be required. Changing bedpans or helping your client to the restroom may be required daily tasks. Education beyond high school is not required for these positions. Some health care aides working for agencies may be required to become certified. Certification and training can make you more competitive in the health care aide industry, as well as start you down a path toward a career in nursing home care, retirement home care, or nursing. The average pay for personal care aides in 2012 was $20,830 according to the U.S. Department of Labor’s Bureau of Labor Statistics (BLS). The BLS also reported home health aides made an average of $21,830 in 2012. Growth in this industry is expected by the BLS to skyrocket with a 70 percent increase in available positions between 2010-2020. This is a much faster growth than the national average. Pursue Education. Though not required initially for the job, training and education will help you advance and find a stable career in the health industry. With a low salary, long hours and hard work, high job turnover is usually a common issue in this field. Show Responsibility. Babysitting, dog walking—there are many ways to show you can be responsible in your work. The best way to gain the trust of an employer is to show you are qualified for the job. Start small and practice your care giving skills. Volunteer. Your local nursing home will have activities where volunteers are appreciated. Trips to the store to help a group of elderly shoppers or helping run game nights will be helpful practice for you and will impress a potential employer.